A new report projects that the worldwide automated microscopy market will more than double between now and 2024. Optical microscopy with angstrom resolution? New research in Nature Communications details Cryogenic Optical Localization in 3D (COLD), a single molecule localization technique utilizing cryogenic temperatures to manipulate photochemical processes, allowing for orders of magnitude higher numbers of photons to be detected than conventionally possible. Multiple sites on small-to-medium size biomolecules are independently localized. Now’s the time to enter this year's Nikon Small World photomicrography contest! In honor of our 100th anniversary, you can win $3000 and a trip to our lens manufacturing center and global HQ in Japan for you and a special guest! New open access research in The American Journal of Human Genetics identifies mutations in INPP5K, encoding inositol polyphosphate-5-phospatase K, impairing phosphatase activity and resulting in altered subcellular localization. The provided data links congenital muscular dystrophies to defective phosphoinositide 5-phosphatase activity. Imaging was performed using a Nikon A1R resonant scanning confocal microscope. New research in Nature tackles the mechanisms of cancer cell plasticity in a Kras mouse model of pancreatic ductal adenocarcinoma (PDAC), finding that the emergence of Kras-independent escaper populations is associated with de-differentiation and aggressive behavior. Their research points to a potential therapeutic strategy, check out the paper to learn more! Imaging experiments were performed with either a Nikon Ti, Ci, or Ni equipped with A1R-MP multiphoton scanner. Learn more about Nikon's new Ti2 and Ts2R microscopes in this recent issue of BioTechniques: The International Journal of Life Science Methods! This article highlights how the Ti2’s Assist Guide technology simplifies imaging by providing interactive walkthroughs for critical imaging techniques and alerting users to errors, important for training, quality control, and data reproducibility. We’re honored that our new Ti2 microscope is receiving the 2017 iF Design Award for superior product design! 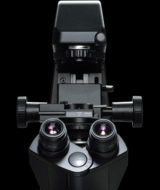 The ECLIPSE Ti2 Inverted Research Microscope was recognized for its groundbreaking field of view, stability, and usability by the iF International Forum Design. Over 5,575 entries were received from 59 different countries and evaluated by renowned experts. The reprogramming of differentiated cells into induced pluripotent stem cells (iPSCs) has become very important in the field of regenerative medicine. New open access research in Scientific Reports explores the role of the p38 MAPK signaling pathway in the creation of iPSCs. Imaging was performed in part using a Nikon A1R laser scanning confocal microscope. The 61st Annual Meeting of the Biophysical Society starts this coming Saturday, February 11th at the Ernest Morial Convention Center in beautiful New Orleans! Come find us at Booth 431 and see our latest Eclipse Ti2 inverted microscope and other imaging solutions. Also make sure to get your own Ti2 TICO brick model! Great crowds in Philadelphia on Jan. 20th for the Nikon Small World Gallery Opening at The Wistar Institute which featured a talk by imaging core director Jamie Hayden. Be sure to stop by and check it out before March 3rd! What role do mitochondria play in the premature senescence of auditory cells? New research in npj Aging and Mechanisms of Disease finds that short H2O2 treatment of auditory cells leads to a decrease in mitochondrial membrane potential and fusion/fission imbalance, providing evidence for the interdependence of these factors in premature senescence. Super-resolution imaging of mitochondria was performed using a Nikon N-SIM structured illumination system. Tissue optical clearing techniques have become an important method for neural imaging. New research in Scientific Reports details an optimized protocol for the Passive Clarity Technique (PACT), finding 42-47oC incubation is optimal for producing faster clearing while preserving fluorescence. Imaging for this study was performed in part using a Nikon A1R-MP multiphoton system with 16x water dipping objective (NA=0.8). Nikon has a new objective for cleared tissues! 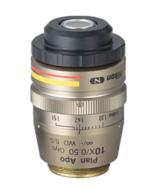 The new CFI Plan Apochromat 10xC glycerin immersion objective features an NA = 0.5, a working distance of 5.5 mm, supports a variety of refractive indices. Check out the “Objective for cleared tissue” section on the linked page to learn more. Did two physicists just succeed in creating metallic hydrogen? Researchers at Harvard University just published a report in Science presenting evidence of this achievement. Polished diamonds were used to apply 495 GPa of pressure (higher than the pressure at the center of the Earth) to hydrogen gas, seemingly resulting in a new metallic form of hydrogen that has yet to be observed. If true, this material could have an array of potential applications, including as a room temperature super conductor. Researchers at Princeton University have published a new article in Developmental Cell demonstrating optogenetic control of Erk signaling in vivo using patterned illumination from a Digital Micro-mirror Device (DMD). They found that development is very robust to ectopic Erk signaling except from 1-4 hours post-fertilization. Fluorescence imaging was performed using both a Nikon A1-R resonant scanning confocal microscope and a Nikon Ti-E with spinning disk and DMD for optogenetics experiments. January 23, 2017, via Innovations with Ed Begley, Jr. Check out this great video about USCAP and their approach to microscopy training for pathology, from clinical education to translational research. Learn More @ Innovations with Ed Begley, Jr.
An open-access research article in Scientific Reports details a new approach to multiplexing FRET biosensors for kinase activity (PKA and ERK1&2) in living cells using only a single excitation wavelength for simultaneous dual-color FLIM. LSSmOrange-mKate2 and mTFP1-ShadowG were the FRET pairs chosen, both donors excited by 440 nm light and all probes being spectrally separate. Sensitized emission measurements were made using a Nikon Ti-E inverted microscope with Nikon DS-Qi2 sCMOS camera. In celebration of Nikon’s 100th anniversary the Small World grand prizewinners will receive $3000 and an all-inclusive trip to Japan, joining us as our special guests at the Nikon Worldwide Headquarters. The lucky winners (and their lucky companions) will also receive a private tour of Nikon’s glass and lens manufacturing facilities. Learn more and submit your winning image today! This is a special year for Nikon. We are humbled to be celebrating our 100th anniversary. From cameras to lithography to microscopy, Nikon strives to illuminate our world. Please check out our special 100th anniversary site and commemorative movie detailing both our past and vision for the future. Are you looking for a career with a dynamic and fast-growing organization? Nikon Instruments is looking for a Bioscience Consignment & Trade Show Administrator. Key responsibilities of this position include coordinating equipment for tradeshows, workshops, and more. This is a great opportunity for non-specialists with strong organizational skills and who are available to travel to learn about optical microscopy and the medical device industry. To learn more and to apply, please visit our careers page.